Just a quick note to catch up with some folks that I know read the blolg but that I don't have a way of reaching right now. But first.....y'all really covet that Indulgence, no? We've had several folks e-mail (and call) to get some, and I am sad to announce that the grass green shade is no longer available (it left yesterday, actually). However, every other shade is still on hand, all but the baby pink are available in good quantities (we have just about 10-15 of the soft pink left). I tried to send an e-mail to you but the address I wrote down wasn't the right one, and I don't have a phone number for you. Here's the colors you asked about--so maybe take a gander and then give us a call, ok? Sorry for the confusion on this, but I couldn't think of any other way to reach you. I spoke with Nancy Lindberg (designer of the felted gloves pattern I mentioned yesterday) about amounts of yarn for the Indulgence felted gloves. The pattern calls for sport-weight yarn, but she said she was able to sub the Indulgence perfectly for the pattern and that they were (she repeated) "just sinful on her hands". As for sizing and quantity of yarn, the pattern is sized for a ladies' small (6.5" from wrist to end of your "naughty finger"), ladies' medium (7.5"), or men's (8"). For quantities, one skein of Indulgence will make the small, one skein SHOULD make the medium (but she cautioned that it would use EVERY LAST INCH of the yarn and there's no room for adding an extra row by accident--it's that close), and men's would take two hanks. So for those of you contemplating the pattern, be sure to measure your hands for the right fit. She also shared a couple other tips with me about the pattern that I'll include when you purchase it. Nothing like perfect advice from the designer herself--I'm very fortunate to have such a great relationship with our suppliers (more on that in my next post--the mail brought COOL stuff today). Linda S. asks how to receive our newsletter (no offense, but I'm a little wordy, so they're far from "little".....). Each week, typically on Wednesdays, I send out a note that lists all of our new arrivals in yarn/books/accessories and more, what to expect in the next week (newly ordered stuff), any events/classes in the coming week (mostly of interest to our local folks, but sometimes people at a distance come to town for things), and I always include 3-5 freebies (websites or patterns or other good resources for knitters)--that's my little bit of value added for having to slog through the other parts. If you're interested in receiving a copy, slide on over to the ThreadBear main website and find the green "receive updates via notifylist" box beneath the calendar on the left side of the page. That will automatically add you to the notifylist service that I use. Thanks for asking!! As for my next project, part of the "cool stuff" that came today involves the making of this pattern that's a freebie from the Crystal Palace website. Well, I received some of the yarn needed to create this jacket and will commence the knitting of our shop model in about 5 minutes. The remainder of the yarn (all of the shop stock) leaves California on Monday, so I expect it on the 12th. In the mean time, this looks like it will be a fun and amazing project. And it's had great reactions from our local folks, as you can knit a wool jacket with fab style for about $50. YES! With that, I'm outta here for now. It's been a VERY busy day and I wanna knit for a bit and then grab some tacky Mexican food.........I'm hungry!!!!! (I had a handful of chocolate chip cookies for lunch today, about 3:30 or 4 p.m., and no breakfast--it was THAT busy). Ravaged. We have just over a dozen each of 130 and 131, and we have 50-60 skeins of 115. And about a half-dozen assorted singles, all lonely and sad looking. Silk Garden isn't as devastated, but...........I'm glad to be getting more stock in it as well. If you've requested yarn and asked to be put on the "waiting list", you'll be first to be contacted for the colourways of your choice. If you're interested in some and want to be on the wait list, lemme know. Speaking of impending arrivals and massive quantities, I've placed or next Koigu order, which I'm told will arrive near the end of the month. I've asked for 700 skeins of KPPPM, 100-150 KPM, about 200 skeins of Kersti, and a good bit more in Rumba and Fancy, as well as additional patterns. That should hold us for a little bit, I hope. I just can't wait to see the walls of color when all of this arrives in a few weeks. YUM! Now, for what I intended to converse about. Time for a little "housekeeping", or tieing up loose ends (pun intended). Left to right, they are Rainbow, Tuscany, Cool, and Iris Garden. He had asked about the orange and green (Rainbow), the bronze (Tuscany), turquoise (Cool), and magenta (Iris Garden). This yarn is Shepherd Sock, which knits at about 7-8 sts/inch and runs $8.75 retail/$7.88 ThreadBear per skein. That's Vera on top and Mountain Creek on the bottom (but you don't see the bright blue in the mix--it must be on the bottom, but there's hints of it near the purple). Again, Shepherd Sock and it knits up just beautifully! Along the side of this shelving unit you'll find another 40-50 skeins of the natural, 30 of the hot pink, 10 of the kiwi/spring green, and 20-30 of the royal purple. All is still safe for those who love amazing fiber. But once these are gone, that's the end. There's no more in the warehouse in Seattle (I've checked). It makes warm and amazingly soft garments, and I've yet to try the felted gloves (but you know me, I will soon). Lorna's Laces Angel--many of you have been seduced (and rightly so) by the amazing scarf knitted by Theresa (she posted the pattern on December 29th). If you're interested in some Angel (70% angora 30% lamb's wool) and want some from us, I'm ordering on Monday when Lorna's reopens for business after their holiday break. Please let me know what colourway and how many skeins (the scarf took four skeins) you'd like. The price per skein is $10-$11 full retail, and we offer it for $9 (10% off every item, every day). It sounds like a pricey yarn, but even four skeins means you have a lush scarf for just $36. And the available colors are just amazing. Just lemme know. Exact disposition of these beauties will be revealed shortly, when they arrive at the beginning of the week and in case the recipients are part of my readership. The purple/blue one is Lana Gatto Amsterdam in color #15. The one across Tate's body (Splash in Picnic) remains here at the shop, serving as a model of how Splash knits up. All three were quick knits (maybe 2-3 hours each) and completed yesterday. Poor little guy.......I disturbed his morning nap for that shot. The left column is (top to bottom) Lost Trail, Firestorm, Rimrock, Mountain Twilight, and Silverbow. On the right, (top to bottom) we have Red Tail Hawk, Winter Sky, Wilderness, and Pheasant. This is divine yarn--a seven ounce skein has 440 yards of hand-dyed superfine alpaca/wool (50/50) that knits at the worsted/aran gauge (4.5 or 5 sts/inch) and is $40 retail ($36 from us). YUM! We have two of each of the skeins pictured here, which is plenty to make a garment--Matt wears a vest he knitted in Pine Needle a few years back when we lived in Michigan, and it is just stunning! Mountain Colors has a great mobius shawl pattern as well that calls for one skein. With that, I think I'm out for now. A few orders have rolled in while I've been writing, so I'll pack them up (coincidentally, both are ordering Indulgence....before this post ever went up). Both are, however, repeat "offenders" on the Indulgence, so they know what they're getting into. Smart women! Be well, and I'll be back shortly! We meet the best folks through ThreadBear. I say it regularly, and I make sure (I hope) that everyone knows that I feel more than fortunate to be doing what I'm doing. And sometimes, people walk into your life for specific reasons--and they become friends, or even special friends. And for me, this is one of those cases--if I embarrass anyone, so be it (grin). I just want it known that I appreciate kindness and friendship when it's lavished upon us. Theresa and Bonne Marie paid a (well documented) visit recently, and part of the trip was to show us Theresa's latest creation, a stylish felted design from her fertile mind. Unfortunately, the bag made it as far as the alley behind her home in a central-city neighborhood (fortunately rescued by a loving spouse, who found it perched on their garbage cans--a very Chicagoan thing to do when you find something of obvious value that you think someone else would like back--don't ask, as it's a lot like the snow-cleared parking space in front of a home in winter with an ironing board or chairs and a 2-by-4 in the space. If you're from Chicago, you understand these idiosyncracies). 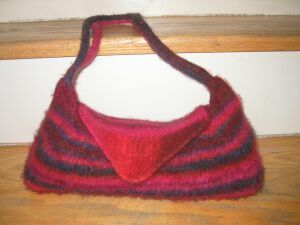 So my date with a felted bag was not to be. Great details, well-written instructions, and the perfect size for rumbling around town. Should you want to make your own version, you can purchase the pattern here through Theresa or we have physical copies of it here at The 'Bear. I post the link to Theresa as a source to direct as much of the benefit to the designer as possible. Kinda like when we get a request for a Bucket-O-Chic pattern. I'm glad to include a hard copy of Chicago in any order going out from us, but do consider turning to Theresa for yours. Sorry for the crap picture, but what you see are two intricate origami boxes that contain two hand-made stitch markers with a bear fetish dangling on the end. Theresa made these last spring (or earlier??) and we both fell in love with them and bought some bear and other fun beads of our own, but it never got done. T knew we admired them, and low and behold she surprised us with a wonderfully kind gesture and thoughtful gift. Much thanks, from us both! I told you we get to meet the most fantastic people through this business! I did knit a little bit yesterday evening, once the madness calmed down. Tuesday was a WILD ONE at the shop, with groups of people coming (I swear there's now a stop where a tour bus lets off hoardes of yarn-starved shoppers---and being the enabler that I am, I revel in it!) and a steady stream of folks wanting something for an after-the-holidays knitting project. We started several new knitters on their second/third project, we had several folks come by to redeem their gift certificates, and saw a number of very familiar smiling faces. Connor and Tate just eat up the attention--they're so mistreated around here. Pshaw. Today looks to be more of the same, I'd imagine. HOORAY! One of the highlights of my day was getting to speak with Susan Druding, one of the major forces behind Crystal Palace Yarns and the creative soul that has been churning out their great scarf pattern and ideas. 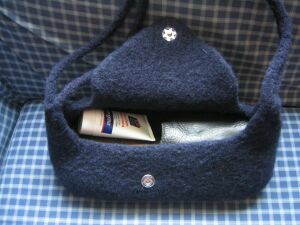 The new post for the day (yes, they've been adding things DAILY) is a cotton chenille pattern for a simple face cloth. I'm sure I had a little bit of "I'm your biggest fan" in my voice when she picked up the line yesterday--it was my own personal brush with fame. And she mentioned reading my blog--WOW! Thanks, Susan (and your wonderful staff) for the impeccable service and fantastic yarns and creative patterns. WE LOVE YOUR GOODIES (and I cannot wait to see my latest boxes---we placed a fairly large order on Monday, which included a couple new fibers for us). Well, that's about it for now. Off to go get the place opened and ready. It's 9:55, so I have five minutes to make myself presentable. Be well, knit like mad, and be in touch. But most of all, THANK YOU for a fantastic 2003. Again, stealing a lead-in from Wabi-Sabi, who doesn't seem to use lyrical introductions any longer......this old Steve Miller Band chestnut fits the times around ol' ThreadBear of late. I had pictures taken, I had a concept for a Monday post, but the time got away from me. We had a good bit on our "to do" list and if I don't get a post tucked away before we open at 10 a.m., it ain't a-gonna be happening during the day any longer. Heck, I can't get but one or two packages wrapped and out during the day, so there's no way I could dedicate an hour plus/minus to a post while we're open. The foot traffic has been awesome of late, and we're very grateful. And the UPS driver is getting a little surly in recent days (too many deliveries? the entire "I'm glad to have the job security" thing worn off? who knows......he was a jerk yesterday......and those who know me won't be surprised that I flipped some jerk back at him....LOL...if you start it, I'm gonna get the last word--just ask Matt). By the way--have you seen? Matt posted two days in a row.....and one of them is about ThreadyBear. Faithful readers will remember a small debacle back in May of this year.......then a move here, our wild autumn, and the holidays......but finally, yarn is ordered, the pattern is ready, and we'll be teaching an Introduction to Fair Isle Knitting class starting in about 10 days. Don't worry--I think there's a knit-along brewing (based on comments on Matt's blog since yesterday). I don't have details, but I'm sure he does over at CrowingRam. Monday, Monday............we had a fun one, filled with friends and customers coming by all day, busy with attempting to assemble four or five yarn company orders (one was completed, by Matt), and then a surprise visit by Lana and Josh, who came over for the evening for dinner and whatever else you cannot expect around here. We all ended up at a local pseudo-Mongolian barbecue place that we love (did I hear someone burping in the background? ), came back home, said our goodbyes, and Matt and I worked on stuff again until about 1:30 a.m. Yeah, such the glamorous life. But I wouldn't trade it for anything, trust me. We have incredible friends and we're very fortunate. On to the knitting! More Angel, this time for Meg in Chicago. Megster asked if we could get ahold of this in the nick of time and got lucky--the very day Lorna's called to say they were shipping Meg requested this yarn, and coincidentally they had exactly four on hand in the very colorway she wanted--Happy Valley. Meg--take that as a giant indicator that you're living right. These little beauties await transport back to Chicago with your friends in a couple weeks. In the mean time, they will be loved here and treated very well. I'm not sure what is spurring this interest in Angel, and we're thinking about adding it to the yarns that we carry (it's just sooooooo soft and soooo beautiful), but I'm sure that anyone who sees Theresa's awesome scarf over at Keyboard Biologist (LOVE her redesign!) can understand (she even freely shares the pattern she used for her scarf, of her own design). Her version uses the colorway Aslan that she picked up from us recently. Granted, the folks at Lorna's are out for the holidays, but if you're interested in having some of your very own, I will gladly special-order any colorway your little heart desires, and then you, too, can have a soft and amazing piece of knitting. TREAT YOURSELF! (grin). Also in the incoming boxes yesterday (not to mention more Brown Sheep, mostly Lamb's Pride worsted--all backorders) was a small batch of Lana Grossa yarns. The first of the new stuff we just ordered a couple weeks ago has started to arrive, and all of the summer yarns we ordered have been requested and await delivery to the USA from Germany. WAHOO! In the mean time, we did get a brand new and rather fun yarn called Leggero and Leggero Stripe, in a few of the colors available (more are coming--they're on backorder). I'm just thrilled that we've decided to stock a good bit of Lana Grossa yarns--they're unique, they're reasonably priced (not bargain yarns, but reasonable for the quality and very fun textures and designs), and they're readily available (no horrid backorders). Plus we have a fab sales rep (I've said this before) who's very honest with us about the yarns (she's been to Germany to see the operation and to meet the key folks there). Plus that whole "Free Pattern of the Month" thing (on their website, on the left side). Nice! I leave you with a thought for the day.........how do you know when you've overdressed for an occasion?